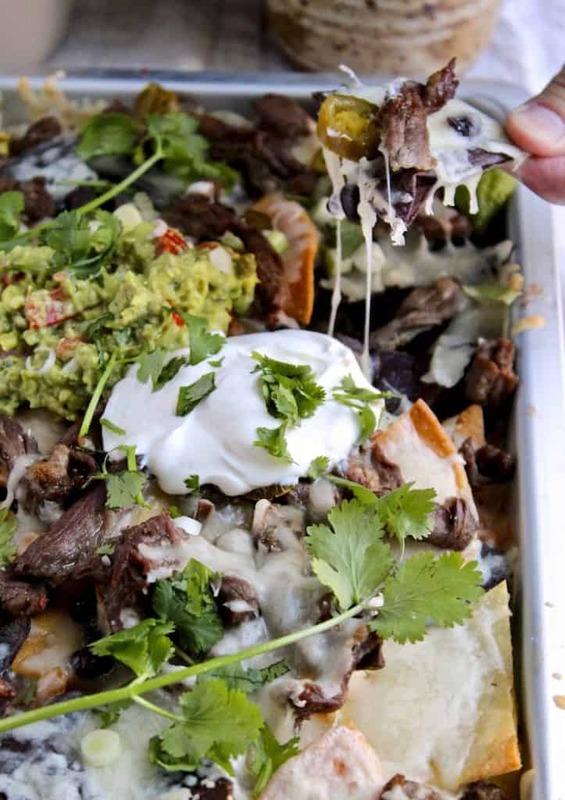 Who doesn’t love a pan of nachos? Or a plate, like my kids used to make after school. They’d pile chips on a plate, top with some shredded Mexican blend cheese and pop in the microwave. Then came a big plop of sour cream and their snack was complete. 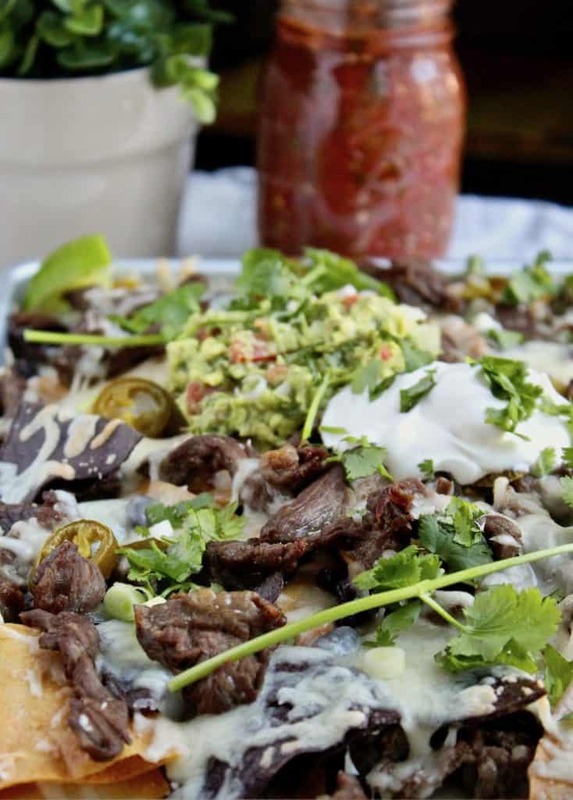 I’m opting for something a little more substantial here ~ loaded steak nachos. When we first moved to St. Louis, we lived down the street from Nacho Mama’s, a great place for Tex-Mex. We went all the time and almost always got their nachos grande, either beef or chicken, and a margarita. Loved the atmosphere of Nacho Mama’s, I hear it’s housed in a former fast food joint. They’ve done a great job with the decor and they’re always packed. Picky Eater and The Boyfriend came in for the weekend, so you know I was cooking favorites for them. I decided to send them off after a lunch of steak nachos, patterned after Nacho Mama’s. These nachos were also Sunday football fare for Meathead. 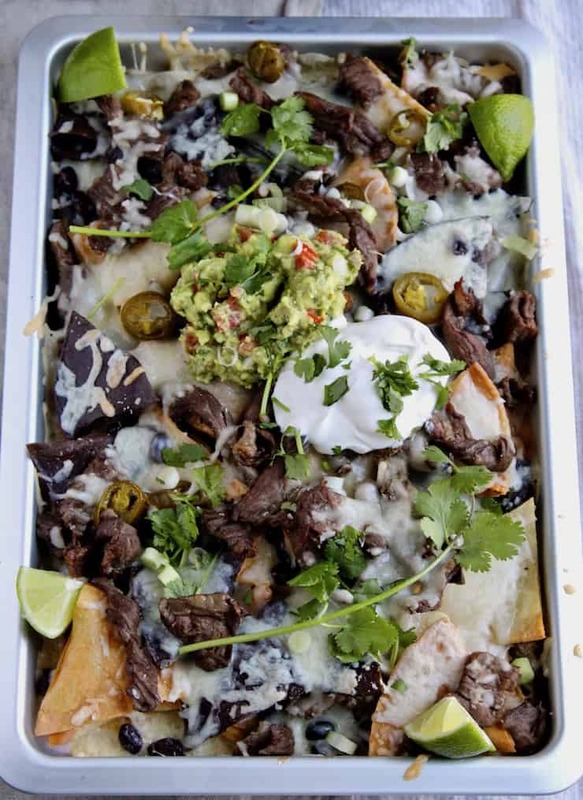 Let’s just say these loaded steak nachos were a huge hit, and The Boyfriend went in for seconds. I opted to make homemade chips from yellow and blue tortillas, for two reasons. They taste better than packaged for sure and they’re also thicker, and thus more sturdy to hold all the toppings. I’ll footnote how I made the chips, not hard at all but, you know, time consuming. For the steak, I used skirt steak I found at a local Mexican grocery/taqueria. Skirt steak is what I prefer but it can be hard to find. Another Mexican grocery I like uses top round for their tacos and quesadillas. That’s probably easier to find. Just cut it up in pieces and add a little seasoning. 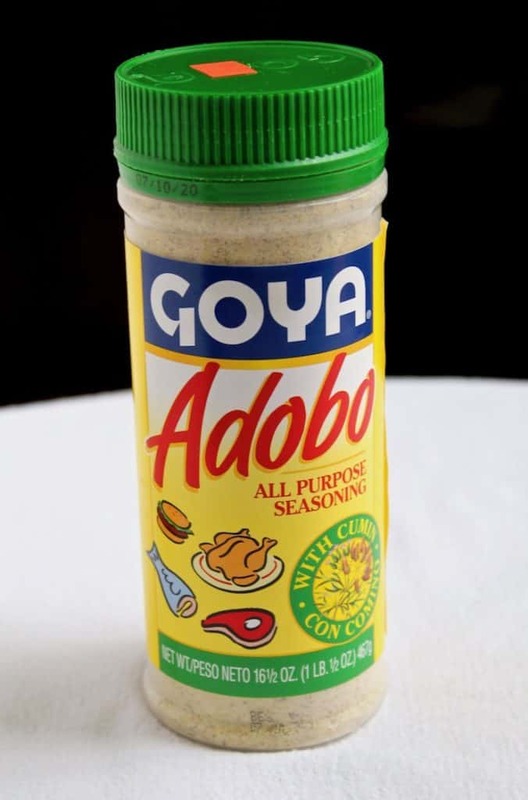 I got in a discussion with the grocery store owner and cook, they use very little seasoning, just salt, pepper and maybe Lawry’s or Goya Adobo all purpose seasoning, that’s what I used, the one with cumin. The cheese. Use whatever you like and I suggest monterey jack or cheddar, or both. I used a shredded white cheese from the grocer called quesadilla Mexican style shredded cheese. I was picking up most my ingredients at the Mexican grocery. The rest is just loading the nachos up with beans, jalapeños, sour cream, cilantro, scallions, homemade guacamole and salsa. The end result ~ incredible. 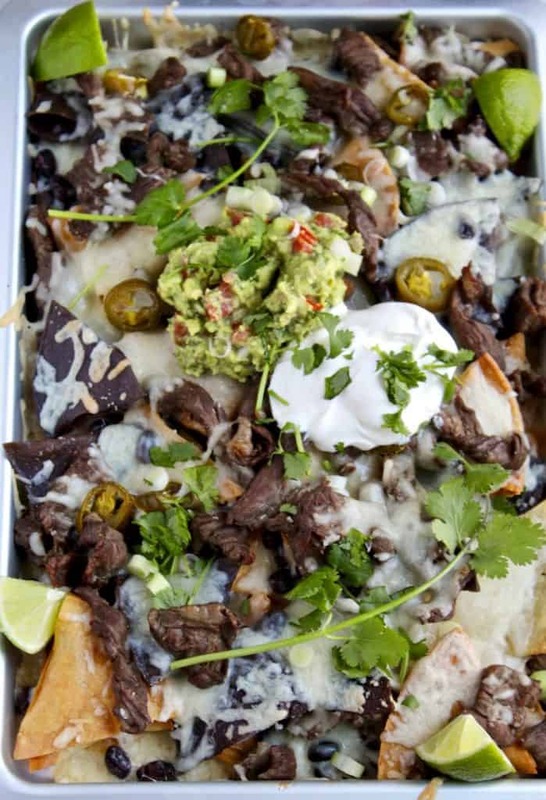 Try these loaded steak nachos, for a snack on game day or for dinner. And you can tweak the ingredients any way that suits you. That’s what I love about nachos and Tex-Mex, just go for it. Don’t forget the margaritas! 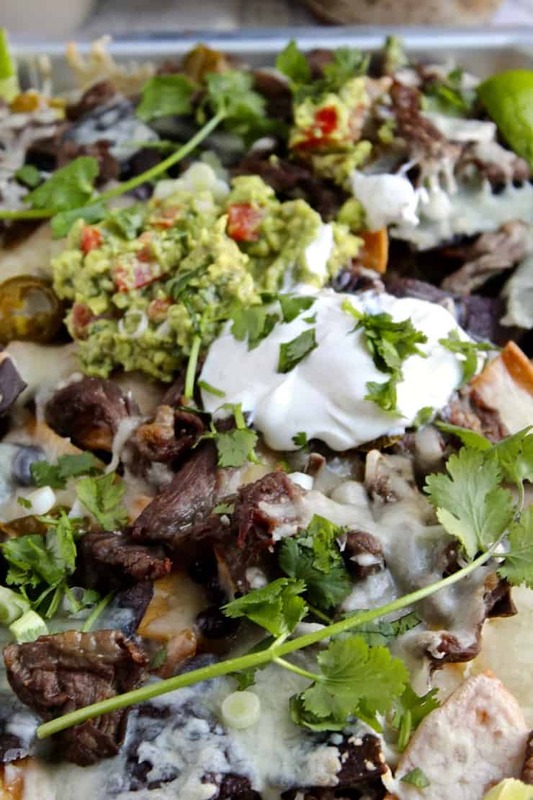 Nachos loaded with seasoned steak and all the fixings ~ made with homemade tortilla chips. Assemble nachos for oven. Use a sheet pan or dish approximately 10" X 15". 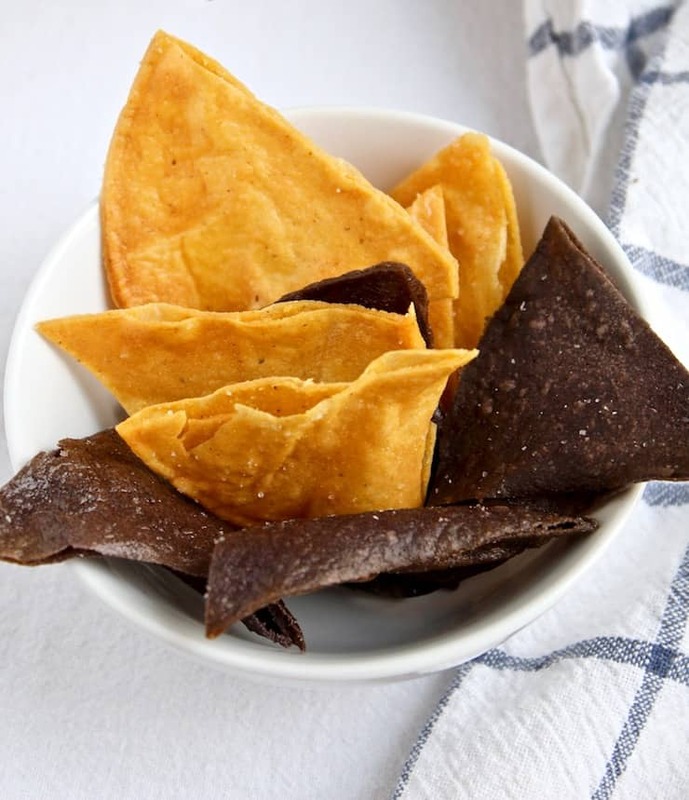 Scatter tortilla chips over the bottom, overlapping and completely covering the bottom. Evenly toss on some black beans and about half the cooked steak. Top with a cup or so of shredded cheese. Add another layer of chips, beans, steak, more cheese, a few more pieces of steak, and then jalapeño slices, to taste. Bake in center of oven for 10 - 15 minutes until hot and cheese is melted. 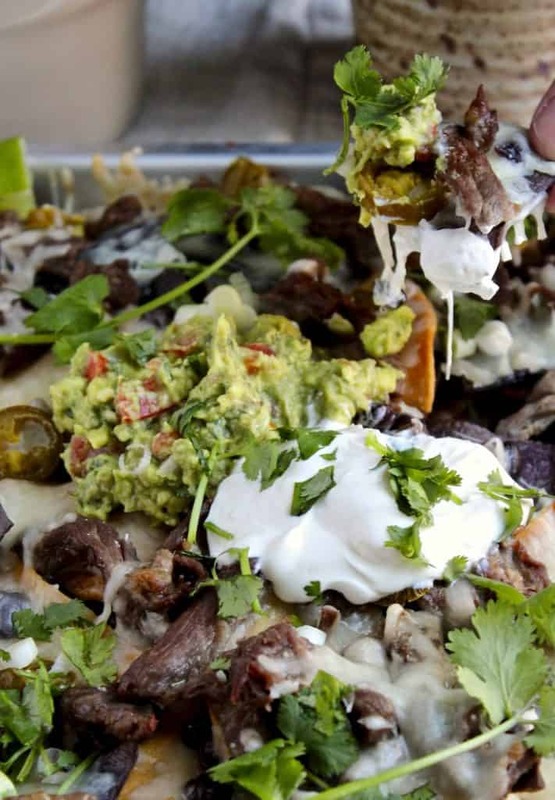 Top nachos with a big scoop of guacamole and sour cream. Sprinkle with chopped cilantro and sliced scallions. Drizzle with some salsa or serve salsa on the side. Dig in and enjoy! Homemade Chips: Cut 12 corn tortillas into 6 wedges each. Use 6-inch yellow or blue tortillas, or both. In medium skillet, heat about ¼ to ½ inch neutral oil, like canola, until hot and shimmering but not smoking. 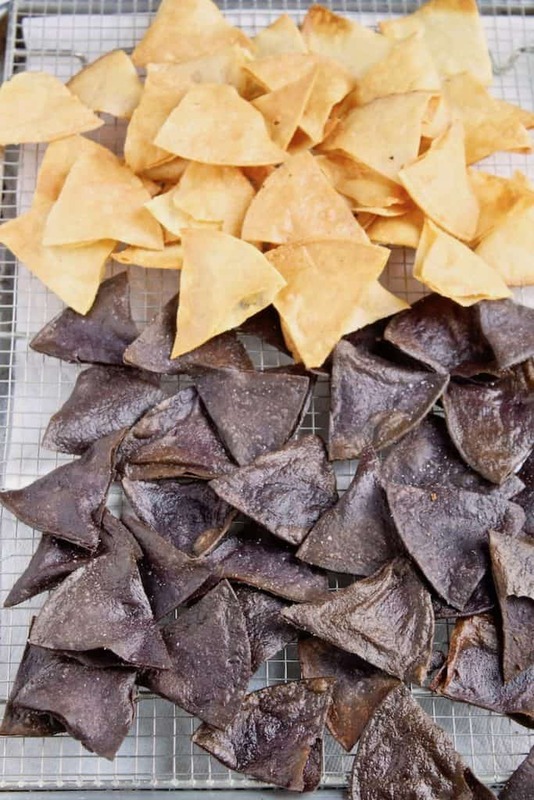 The tortilla wedges should sizzle when they hit the oil. Fry 6 - 8 tortilla pieces at a time for about 2 minutes, until just crisp. Remove to paper towel-lined plate or pan to drain, sprinkle with a little kosher salt while warm. Repeat with all pieces, layering with paper towels and salting.